Set in landscaped parkland, this sprawling coastal lodge-resort in New Milton is 0.7 miles from Barton on Sea Golf Course, 4.5 miles from the town of Lymington and 5.3 miles from the New Forest National Park. The park is perfectly located to enjoy the beautiful New Forest and the sandy beaches of Bournemouth. Our home from home caravan is situated within a 10 minute walk from park facilities which include a newly refurbished Indoor Pool, Fitness Suite, Kids Club, Reflections Day Spa, Bars with live entertainment and Restaurant with takeaway and Pizzeria, Seasonal Outdoor Heated Pool, Mini Golf, children's play areas and a well stocked Spar supermarket. Our modern 2014 two bedroom en suite Caravan which sleeps up-to 6 guests is situated on a south facing pitch within the highly sought after Sea Breeze area backing onto woodland on the 5* Shorefield Country Park. Just a 10 min walk to the shingle beach of Milford on Sea overlooking the Isle of Wight and the Needles. The caravan is fully furnished with one double bedroom and en suite WC as well as large double fitted wardrobes. The second bedroom has two single beds which can be joined together along with a single wardrobe for storage. The modern bathroom has a large Power Shower. The kitchen/lounge area is open planned with plenty of seating which includes a pullout double sofa bed and a dining table. Kitchen is modern and fully equipped with Microwave, Kettle, Toaster, Fridge and full size Gas Cooker. Electric Fire within the lounge area with full Central Heating via radiators throughout and double glazed windows. Included is a docking station, large TV with freeview, a PS3 console along with a selection of games, Children/Adult games as well as a selection of books. Located immediately at the front of the caravan are 2 parking spaces along with a sunny grassed area ideal for children to play, along with table and chairs. Free Wifi is available throughout the caravan & main park facilities. Membership passes for the site are not included but can be purchased from the site office if required.• Tea, Coffee and Sugar will be provided but we just ask for them to be topped up if used.• Electricity and Gas are included within the rental of the caravan. If you have any questions about the caravan or the site please feel free to contact us as we are here to help.Short breaks are also available throughout the year so if you cannot see what you are looking for just let us know. 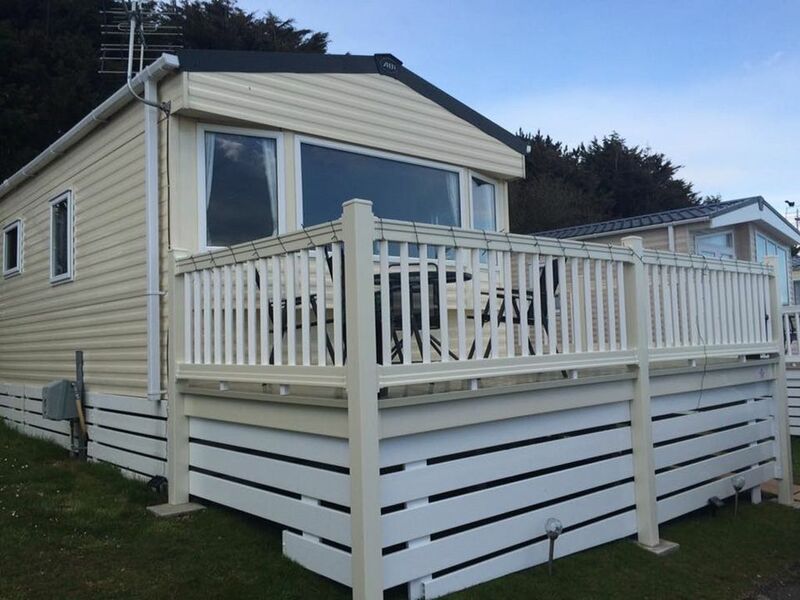 See OurShorefieldcaravan face page for more pics and details. This is a holiday home and will not be let to contractors. Shorefield Country Park is a 5 star rated holiday park set in 100 acres of landscaped grounds. It has also been awarded the David Bellamy Gold Award for conservation. Nearby is a 27 hole golf course (at Barton on Sea), horse riding stables, nature trails, cycle routes and fishing all in beautiful surroundings. Facilities on site include: Indoor and outdoor heated pools, play areas, tennis courts, fitness suite, gym and Reflections Elemis Day Spa, clubhouse, bar and lounge, restaurant and bistro, supermarket. Entertainment programme for adults and children. The pebble beach front at Milford on Sea can be reached on foot through the park in 10/15 minutes, or by car within 4/5 minutes. The views across to the Isle of Wight are beautiful, as are the sunsets. There are foot ferries that run from Keyhaven, which is just along from Milford on Sea, and will take you across to The Isle of Wight. Alternatively you can drive to Christchurch/Mudeford Quays in approximately 15/20 minutes. Other nearby coastal areas include Barton on Sea, Highcliffe and Bournemouth. Mudeford is the nearest sandy beach. From Mudeford Quay you can take the ferry across to Hengistbury Head and the beautiful Sandbank beach with its colourful beach huts. Lymington, with its shops and bustling quay is only 3 miles away. You can walk or cycle there from Milford / Keyhaven along the estuary paths that run through the old salt flats - a haven for birdlife. The New Forest is only 3 miles away. The New Forest tour bus stops at Shorefield during the summer months and drops you off at local sightseeing spots around the New Forest. There is lots to do locally with the attractions of Beaulieu, and the famous motor museum only a few miles away and Peppa Pig World at Paultons Park world is also nearby for fun days out. This rental can only be paid for online through This website. No Stag or hen parties and same gender large groups. No third party bookings or bookings for work purposes. Full gas central heating using radiators. Free Wifi throughout the site. Lovely clean and comfortable spacious caravan. Excellent facilities on site, caravan great place by trees, felt private. 15 minute walk to beach. Perfect. We have stayed here twice now and both times were very enjoyable. Easter sadly the weather was not on our side but the caravan stayed lovely and warm and was very clean and comfortable! This time we stayed July during the heatwave and it was again very enjoyable. The caravan was again lovely and clean and in such a peaceful spot. Everything you need for a get away. Close distance to lots of different attractions and places to visit. Indoor and outdoor pool on site as well as the entertainment was all very enjoyable. We would 100% recommend this to anyone at all. Thank you again for the wonderful stay! Booked at very short notice for my Parents-in-Law, they really enjoyed the caravan and all that it and the local area had to offer. Should they have required it the site had everything that you could possibly want to make for a pleasant stay. Visits were made to Milford, Hurst Castle and Mudeford amongst others, together with refreshing dips in the sea taken. Steve and Suzie very helpful ensuring that all went well. A BIG thank you due. Excellent caravan perfect for holidays with children. Well furnished inside and very clean. Set in a lovely area of the park, very quiet next to the woods. Unfortunately when we were there the play park was closed as it was being re-vamped but from what we saw it looked really good. Swimming pool was great (the outdoor one doesn't open until June) and the passes to use the leisure facilities were reasonably priced for a family pass. Great location near the seaside and other attractions in the New Forest. Be prepared to have to take everything though - can understand having to take bed sheets and towels - but even things like toilet paper and hand soap were not in the caravan which would have been useful things to have on first arrival. Overall, a great stay!